Sinusitis is a condition in which the sinus lining becomes inflamed. Sinusitis can be chronic, lasting longer than 3 months, or it can be acute, lasting for less than a month. Sometimes, this leads to the blockage of the sinus opening, which prevents mucus drainage. This causes recurrent sinus infections with painful symptoms. Your healthcare provider may use a variety of approaches to treat sinusitis and clear blockage. Two of the most common approaches are medical therapy and Functional Endoscopic Sinus Surgery (FESS), but there is a third approach too called balloon sinuplasty, which involves using balloon catheters during surgery. The procedure is effective and balloon sinuplasty recovery may not take long. Introduced about nine years ago, balloon sinuplasty is still a relatively new procedure but is a great option for patients who have not seen any improvement from typical medical treatment. Approved by the FDA in 2005, the procedure involves dilating your sinus passages by inserting a wire catheter into the sinus with a small balloon over the wire. Once inserted, the balloon is slowly inflated to cause the sinus passages to open up. This helps drain the infected mucus and improve your condition. The procedure starts with your surgeon inserting a special instrument called a 'guide catheter' into your nostril. Your surgeon will have clear view of inside through an endoscopic visualization system – this helps them guide the catheter into your sinus cavity. The next step is to place a guide wire with a small light at the end into your blocked sinus. 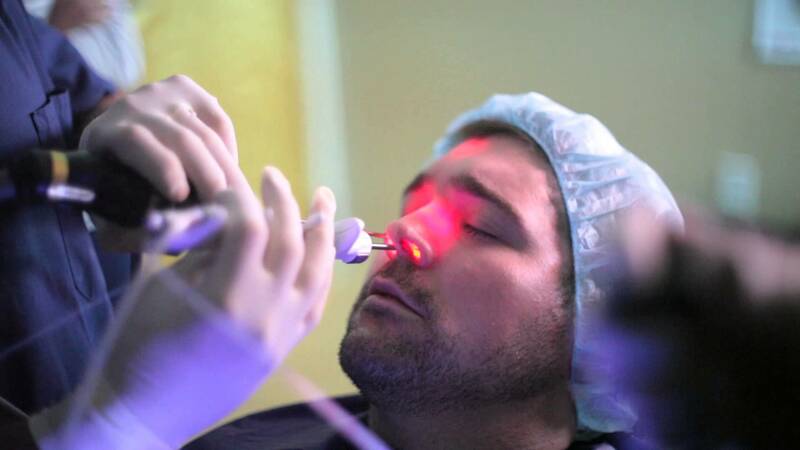 The light helps your surgeon place the catheter accurately into the sinus. The next step involves placing a balloon catheter over the guide wire and sliding it into the sinus cavity. Your surgeon will let the balloon inflate slowly, which in turn will remove any blockage in the sinus. Once done, the balloon is deflated. Your surgeon will remove the balloon as well as the guide catheter and wire. You may notice a small amount of bleeding after the procedure, which is quite normal. Balloon sinuplasty recovery does not require a lot of time and you can return to work after a day or two of the procedure. It is never easy to deal with chronic sinus problems. These problems are usually the outcome of allergies but in some cases, chronic inflammation and infections do not respond to antibiotics and other medications. This is when you may have to look for other alternatives to prevent symptoms of chronic sinusitis, such as blocked nasal passages, colored mucus discharge, continual sneezing, colds, and pain in the area beneath the eyes and temple. It is possible to treat these symptoms with medications when they appear occasionally, but you may consider going for balloon sinuplasty if you experience them on a regular basis. Be sure to talk to your doctor and determine if you are a good candidate for balloon sinuplasty. The procedure is usually quite safe for more people, including seniors. How Long does Balloon Sinuplasty Recovery Take? You do not need to worry much about recovery mainly because it is a non-invasive procedure and causes little to no trauma to the nasal area. It is possible to drive yourself home within 15 minutes after the procedure. You should avoid driving though if you have received any sedatives before the procedure. It is important to bear in mind that balloon sinuplasty recovery may vary from patient to patient. Certain factors can affect the recovery time, including how you respond to anesthesia and what type of anesthesia (local or general anesthesia) was selected to perform the procedure. You may experience a longer recovery time if your procedure has been performed under general anesthesia. You do not usually need to worry about dealing with side effects with balloon sinuplasty because it is a nonsurgical, minimally invasive procedure. However, you may experience certain complications just like any other medical treatment. For instance, you may notice blood drainage for the first few days after balloon sinuplasty – this is quite the same with most nasal and sinus surgeries. Be sure to sleep with your head slightly elevated. This will minimize the feeling of congestion. Always take steroids and other antibiotics as prescribed by your doctor to help reduce risk of infections. Do not blow your nose for at least 24 hours after the procedure. Avoid strenuous physical activities for at least a week; do not worry about moderate exercise like walking. Use saline spray to rinse your nasal passages for 3-7 days after your procedure. This helps keep your nose lubricated and reduce bleeding as well.